As a general rule, when joining two pieces of wood together, use a nail length that will provide the greatest amount of holding power without penetrating the opposite surface. For example, if you are joining two 1 x 4s, each piece of wood is 3/4 inch thick—a total of 1 -1 / 2 inches of wood. To maximize your holding power, you should choose a 1-1/4-inch-long nail. Nails driven in at an angle provide more holding power than those that are driven straight into the work. Toenailing refers to the process of driving a nail into the wood at an extreme angle to secure two pieces together. In fact, the best way to prevent hammer marks on all of your work is to use a nail set. The trick to using a nail set effectively is to hold it in the proper manner. It should be steadied with the hand by gripping it firmly with all four fingers and your thumb. Rest your little finger on the surface of the wood for added stability. If you are working with hardwood, a very narrow piece of softwood, or any wood that has a tendency to split when you nail into it, it is wise to pre-drill the nail hole. Choose a drill bit that is just barely smaller than the diameter of the nail, and drill a pilot hole about two-thirds the length of the nail. If you are constructing a project that will be used out-of-doors, use only galvanized nails. When exposed to weather, ordinary nails will stain the wood a black color, and ruin the appearance of your project. Wire brads are used for attaching trim or for very small projects. They are just a smaller and thinner version of finishing nails. They are designated in length in inches and wire gauge numbers from 11 to 20. The lower the gauge number, the larger the diameter. Tacks have large heads and are used to attach fabric or other material to wood where light fastening is all that is required. The large-diameter head can be strictly ornamental or it can be used to hold something lightly in place. Staples are another light-duty fastener; they are often used to attach fabric to wood. A staple gun is a worthwhile investment and a handy piece of equipment to have around the house. Staple guns are available in many sizes and prices, and, although electric models are available, a heavy-duty hand staple gun will probably be all that you need initially. It is worthwhile to purchase staples in a variety of lengths to have them on hand to accommodate different materials. The advantage of screws over nails is their holding power, and the fact that (when used without glue), they can be removed easily at a later date. Their disadvantage is that they are not as easy to insert. As with nails, there are many kinds of screws. The one most often used in woodworking is a flathead screw. As the name implies, it has a flat head that can be countersunk below the surface. Screws are designated by length and diameter. In general, as with nails, you want to use the longest screw possible that won't penetrate the opposite surface. The diameter of a screw is described by its gaugejiumber, as shown in Figure 7. Common sizes range from #2 to #16, with larger diameters having higher gauge numbers. You should use the largest diameter possible that does not risk splitting the wood. When you are working on very soft wood it is possible to countersink a screw simply by driving it with a power drill. However, the resulting surface hole may only be covered by using wood filler. An alternate method is to pre-drill the screw hole and insert a wood plug over the top of the countersunk screw head. This pre-drilling is normally a two-step operation. First drill the pilot hole using a drill bit the same diameter as the solid portion of the screw (minus the threads). Then drill the larger, countersink portion deep enough and at a diameter just slightly larger than the diameter of the screw head (or the depth and diameter to accommodate the screw and the wood plug you are using). The larger diameter countersink portion of the drilling will center itself over the pilot hole. If you use the same size screws on a regular basis, you may wish to invest in a combination pilot-countersink bit for your drill, which will perform both operations at the same time. You can purchase wood plugs, or you can cut your own. It is easy to slice a wooden dowel rod into many wood plugs. The only disadvantage to this plug is that it will show the end grain, and will be visible if you stain the wood. The alternative is to cut your own plugs using a plug cutter. Screws can be inserted at an angle, the same way that nails are, to toenail two pieces of wood together. After some practice, you will be able to start a screw at an angle with little or no effort. If you find it difficult, simply use a drill or a screw starter to begin your screw hole. One last note about screws—don't be stingy. My own rule of thumb is to join two pieces together; then apply some pressure to the joint to attempt to make it wobble. If it moves, I add some more screws. (Keep in mind that this advice comes from a modest-sized woman—I am sure that any football player could exert more pressure than I can.) You don't want to build a project that contains more weight from the metal screws than it does from the wood, but you also don't want to worry that it will come apart when you decide to move it into another room. Woodworking tools are generally classified into three categories: hand tools (hammer, screwdriver, hand saw), portable power tools (circular saw, electric drill), and stationary power tools (table saw, band saw). It is possible to build any project of wood using only hand tools—and many people do so. For them, much of the joy of woodworking is in the building process, and they are more concerned with the work itself than in how long it takes to complete it. Power tools are not necessary to produce quality results—they just work a lot faster. My enjoyment comes from seeing the finished project, and I prefer to expend the minimum amount of physical effort. Therefore, I use an electric drill rather than a screwdriver, and a table saw rather than a hand saw. If you are starting from scratch, buy the best tools that you can afford. This applies to everything—not just to stationary power tools. A poorly made hammer can be just as frustrating to use as a poorly made table saw. When you are considering buying a new tool, a good source of information is the people who use it on a daily basis. Most woodworkers are happy to share their knowledge with you. 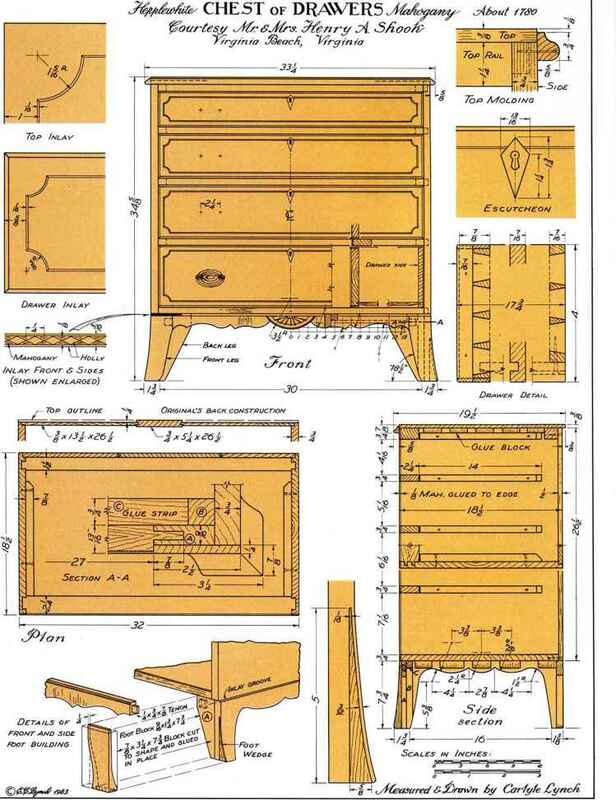 If you don't know any carpenters, books and catalogs on woodworking tools are also good sources of information. Also check the warranty on a tool. If the manufacturer guarantees the tool for life, that's a good recommendation. Match the tool to your physical size and ability. A large man might like the performance and feel of a very large hammer. It would wear me out to lift it. I am more comfortable with a lighter hammer. I will probably have to hammer more times to drive in a nail, but it will be more suitable for me. The same philosophy applies to power tools. I once turned on a very large belt sander to sand a door. It was so powerful that it propelled me across the garage. 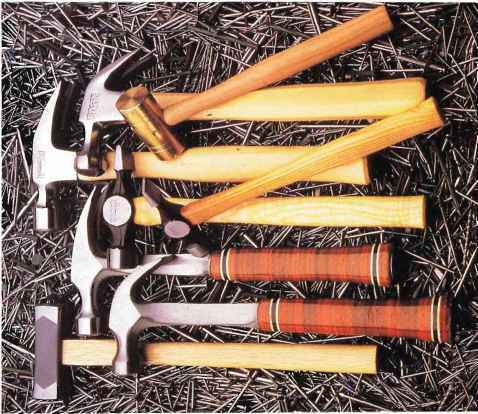 Some tools—hammers and saws are good examples—are universally recognized as being vital to working with wood. Others that are just as important are often ignored because their role is not as obvious. For me, having a solid work surface, a ready supply of clamps, and the right sanding equipment can spell the difference between enjoying my project and just muddling through it. Working Surface Probably the single most important tool in woodworking is a smooth and level work surface. It is virtually impossible to build a quality woodworking project without one. The range of work surfaces varies from the ridiculous to the sublime. It can be as simple as an old door (flush, not paneled) or a piece of plywood supported by sawhorses, or as elaborate as a professional-quality workbench costing thousands of dollars. Bar clamps and pipe clamps come in a variety of sizes. Whatever you use, make certain that it is large enough to accommodate the project you are building, that the surface is smooth and even, that it is solid enough to work on without shifting, and that it is perfectly level. It is extremely simple to level any surface. lust set a fairly long level in various places on the surface, and turn the level so that it faces in several directions. If variations are noticed, shim the legs—or just underneath the work surface—with the thickness of wood that will raise the surface enough to be perfectly level. Attach the shim with glue and nails or screws to make certain that it stays in place while you work. 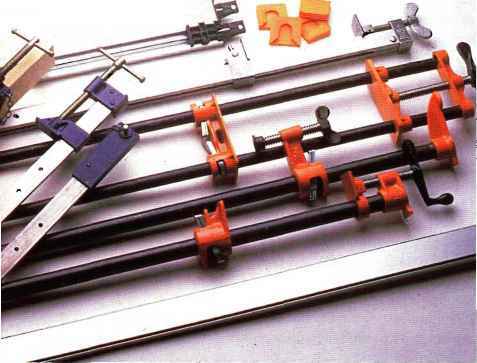 A variety of clamps is absolutely necessary for woodworking. Not only are they used to hold joints together until the glue sets, but they are valuable aids when you try to assemble your project, a job that otherwise requires the concerted effort of several people. When you buy clamps, it is advisable to get two clamps of the same type. This is because you almost always use them in pairs to provide even pressure on the work. When you apply clamps, always insert a piece of wood between the clamp and your work as a buffer. That way you will avoid leaving clamp marks on the surface. Wood hand clamps are extremely versatile since they can be adjusted to clamp offset surfaces. Bar clamps and pipe clamps can be used to hold assemblies together temporarily while you add the fasteners, as well as to apply pressure to laminates. While they look very much alike and function the same way, pipe clamps are significantly less expensive. You buy the fittings separately, and they can be used with various lengths of pipe, depending upon the need. You can also buy rubber "shoes" that fit over pipe clamp fittings, which will eliminate clamp marks on the wood. "C" clamps are useful for many woodworking applications. They can hold two thicknesses of wood together, secure a piece of wood to a work surface, and perform many other functions. A "C" clamp can best be described as an extra helping hand. Web clamps (or band clamps) are used for clamping such things as chairs or drawers, where a uniform pressure needs to be exerted completely around a project. It consists of a continuous band with an attached metal mechanism that can be ratcheted to pull the band tightly around the object. The amount of sanding that you do on each project depends in a large part on the intended use of the project, and on the what kind of finish you plan to use. Obviously, if you prefer a rustic look for your project, it need not be sanded completely smooth. However, a rustic chair requires more sanding than a rustic table—someone will be sitting on it. An indoor cabinet to be stained requires more sanding than one that will be painted. Most sanding can be accomplished with power tools. A belt sander is often used for large jobs. It sands quickly, but it is difficult to control on softwood such as pine. Because of its power, a belt sander can easily gouge softwood or, if you don't watch carefully, it can remove more of the wood than you wish. An orbital sander does a good job of beginning the sanding process, but it may leave circular marks that must be subsequently sanded out by hand. A finishing sander is probably the most practical power sander for furniture projects. It has the ability to smooth the surface quickly, and it does not leave circular marks. 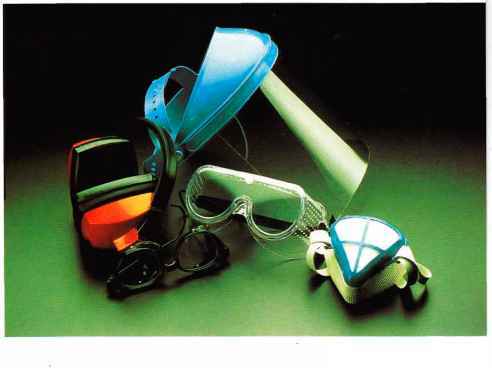 Put safety first, and wear the proper equipment to protect your eyes, ears, and lungs. Of course, any project may be sanded by hand. To sand flat surfaces, wrap a block of wood with a piece of sandpaper. On moldings, use your hand or an object that conforms to the curve. No matter what tool you use, begin sanding with a coarse grit and gradually progress to sandpaper with a fine grit. All of the projects in this book are painted or stained, or a combination of both. One of the wonderful characteristics of wood is that you can apply an almost limitless variety of finishes to the same project. That means, if you like the design of a project, but would prefer it a bright purple, or stained very dark, you can "have it your way." When you select a finish, keep in mind where the project will be used. I always use non-toxic finishes, but it is particularly important to choose substances that are not harmful if you are building something for use in a child's room. If your project will be used in the kitchen where it will be exposed to moisture, you probably should consider using a protective coat of polyurethane or spar varnish. All projects that will be used outside should be finished with an exterior-grade stain or paint, and sealed with a weatherproof sealer. Before using any product, read the directions care fully and follow them explicitly. It will save you lots of trouble. Always use a sealer on raw wood before you paint. It seals the surface and prevents knotholes or other imperfections from weeping through your paint. In the long run, it will save time and materials too; sealing the wood will eliminate the need for multiple coats of paint. Although there are professionals out there who will only use very expensive hog bristle brushes, I never buy any brush that must be cleaned. I have become addicted to sponge brushes, which can be thrown in the trash after use. Don't buy the ones that have visible holes on the surface like a kitchen sponge. Look for the ones that have a smooth surface like a cosmetic sponge. These brushes are very cheap (usually less than a dollar for even a 4-inch width). One last hint on finishing: if you have to stop your painting or staining in the middle of the job, just pop your brush in an airtight sandwich bag. You can leave it there overnight, and it will not dry out.